The first Middle-Earth module I acquired will always hold a special place in my heart, and it's only fitting that it launches this series of retrospectives. I say this with the deflective irony such an accolade needs, for Rangers of the North has a lot going against it. The cover is appalling, looking more like a magazine ad, perhaps because that's exactly what it was, used on the back of Dragon in the '80s to push ICE's products. The mapwork is also a bit light (which I'll get to in due course) and the detail for Annuminas in its glory days non-existent. But it gets highest marks for its treatment of the most tragic yet uplifting nation of men in Middle-Earth: Arthedain, chief among the three sister kingdoms of Arnor. The module actually covers the entire history of the Dunedain starting in Numenor, to the founding of the two realms in exile, to the 2000-year lifespan of the northern one. The contrast with the south is captured perfectly: "As Gondor habitually reached for the sword and shield, Arnor looked to the stars and relied heavily on wizardry, lamenting each bloody encounter in song and verse." As one built an empire, the other fragmented and died, but the latter was truly noble, in my view, and of course ultimately produced Aragorn who would reestablish both realms. There's something incredibly haunting about Arthedain which taps into Tolkien's "long defeat" theme -- that evil can't be defeated; any time it appears to be, it's just a temporary holding action -- and the module stirs tragic emotions in this regard. The specter of Angmar is always in the background, the crushing blow of 1975 waiting in the wings. Arthedain lasted longer than it had any real right to, six centuries after Cardolan went down under the backbiting of its own princes and Rhudaur was swallowed up by the Witch-King. Granted the time it took for Angmar to recover after the war of 1409, Arthedain's endurance is a testimony to the kind strokes of fate as much as to its level-headed monarchs, prescient seers, and vigilant rangers -- not to mention a certain wizard. Gandalf's stats are provided here, along with the details of Narya, the elven ring of fire he acquired from Cirdan, a real selling point of the module. The unique features of the three northern palantiri are also described, and there's even a Fourth-Age scenario premised on the recovery of the two lost seeing stones near the ice-bay of Arvedui's shipwreck. My enthusiasm for Rangers, however, is tempered by the underdeveloped mapwork. There is a two-page color map of the Arthedain region, on the back of which are city grids of Annuminas and Fornost. Yet no buildings of these capitals are detailed, save the royal library at Annuminas, which is admittedly a treat, as it rivals most any library in Middle Earth. But this is the only major layout in the entire module; besides a seer's observatory, and a couple of towns and villages, that's literally it. 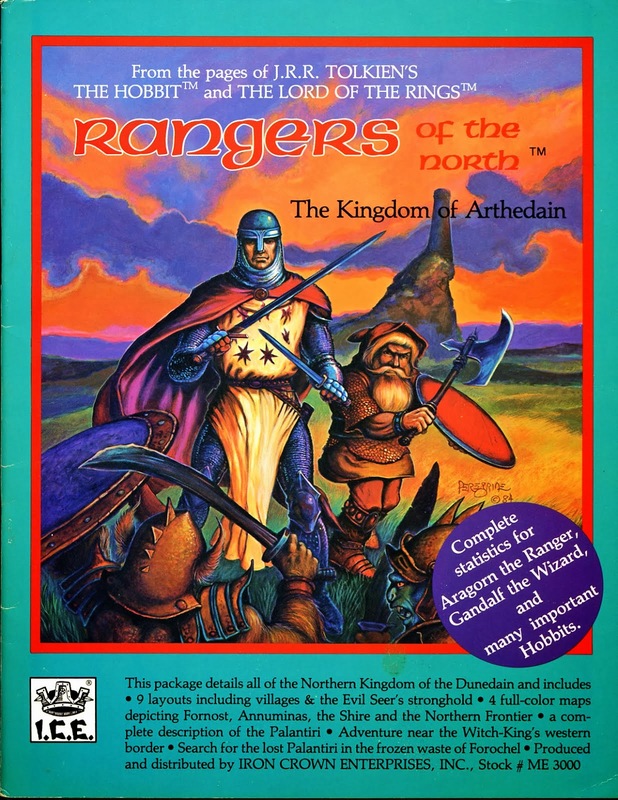 Arthedain isn't exactly a region of "dungeons", to be sure, but other things could have certainly been fleshed out. At the time of purchase I resented the fact that Weathertop of all places wasn't covered, though that was later rectified in a fantastic standalone module. 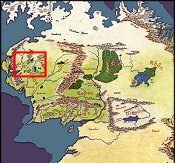 There is a nice map of Numenor derived from the one in Tolkien's Unfinished Tales, and the color map of Arthedain is duplicated in black-and-white displaying the lands held by the seven noble families. The layout deficiencies end up not mattering much, at least not to me, in a module whose strengths lie elsewhere, and which deals with such an inspiring nation where rangers watch from the shadows, and scholars are esteemed as soldiers. 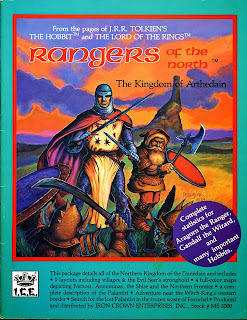 Next up: The Lost Realm of Cardolan. You make some great points in your summaries about the poor quality mapwork of the MERP modules. It's unfortunate, because there is a lot of excellent info in them otherwise. All of the early modules needed better mapwork and better organization. The latter modules, I thought, were just crap.